Is this the campground for you? - You enjoy a quiet, peaceful getaway. - You are friendly, enjoy meeting new people and like to have fun. - You appreciate respect and, in turn, show respect to your neighbour. - You enjoy fishing, golfing, sitting around the campfire and spending time with family and friends. - You appreciate that everyone is on the same page especially when it comes to quiet time at 11pm. - You are a responsible pet owner. - You appreciate concern for children's safety and security. - You are here to PARTY! This is not the park for you! - You love loud music that can be heard all over the park. - You brought your family so that others at the campground can babysit your children day and night. - You love to speed irregardless of the posted speed limit. - You live to let your animals roam free and do not pick up after them. - You don't like the rules! Give us a call at 1-800-859-9452 or 1-780-675-3733. 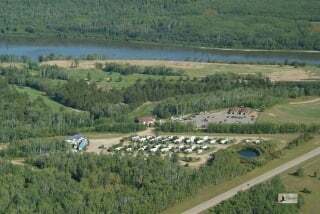 You can also email april@blueberryhillrvpark.ca. Check out time is noon. Extensions are subject to availability. We accept cash, debit, Visa, Mastercard, Amex, cheque and e-transfer! Of course, visitors are welcome! We ask that visitors park in the designated parking area and leave the park by 11:00 pm. Registered guests are responsible for the conduct of their guests and must ensuring that guests are aware of the guidelines and expectations. Pets are welcome, however this is at the discretion of management! We asked that all pets owners be responsible in that they keep the animal on leash at all times, pick up any droppings and do not tie animals to our trees. All pets must be non-aggressive neither towards humans and other animals. We will clarify, upon arrival, that the pet has not harmed or shown any aggression or threatening behaviour towards any person or other animal in the past. Owners will be solely responsible for their pets behaviour. Should a pet demonstrate aggressive or threatening behaviours, it is the right of management to ask the owner be removed from the park. We offer FREE WIFI to our registered guests, in our common area. It is not for public use. 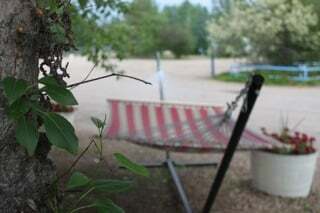 Our guests are welcome to sit on our deck while using the internet. We ask that guests do not download large volume items such as movies, games etc. Yes, we do have quiet time. We ask that our guests be quiet and respectful after 11pm. All non-registered must leave the park by 11pm. How many adults can stay in one trailer? 4 adults is the maximum per trailer. Rental usage is based on 2 adults and children. Extra charges will apply for more adults. We promise to be prompt, friendly and helpful. We will give you excellent service to help make your stay with us an enjoyable and relaxing experience.